Get Invisible War and Firefly Garden together at a reduced price! Note that these are the two individual CD albums, not a double album. 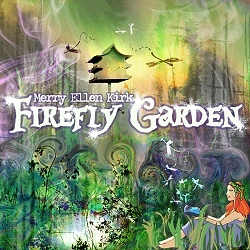 Firefly Garden is the follow-up to Invisible War and was in the making for more than a year, with Merry Ellen posting demo versions of the tracks on the Web throughout the process. Arguably this is her first real album, because of the way the tracks flow naturally from start to finish. Invisible War was more of a collection of individual songs. 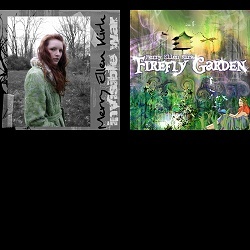 On Firefly Garden we are in a magical land and the scene is firmly set with track 1 - the title track - which is as sweet as honey, but in a good way. The honey keeps flowing on Candy, but then things get a little disturbing and noisy on Do You and we realise that it's not all peachy in fairy land. There are more surprises to come: Claire de Lune is of course the famous piece by Debussy, but Merry Ellen has added lyrics to it, which works surprisingly well. Mosaic is a beautifully crafted ballad, the kind of song that a less talented artist backed by a major label would kill for and could have a huge hit with. The short interludes between tracks work well and contribute to the overall nursery-rhyme-esque and almost gothic sound of the album as a whole - a sound and feel that wasn't present on the demos. This is an interesting new flavour, but the main ingredients are still the same as on Invisible War: exceptional song writing and drop dead gorgeous performance. Tori Amos meets Kate Bush meets Polly Scattergood - in Nashville. This is where Merry Ellen Kirk resides and creates her rich blend of piano-laced leftfield ballads and lyrics that actually mean something. Raised in Mongolia as a child of missionary parents, she draws on experiences far beyond the borders of Tennessee. She is said to find inspiration in the mystical rhythms and melodies of a global community and one day she wants to return to Mongolia and build an orphanage - not the average goal for a young successful artist, but then nothing is quite what it seems with Merry Ellen Kirk. Invisible War was released when she was only 19 years old, yet it is a work of great maturity throughout. One minute you can be forgiven for thinking that she is the secret baby sister of Tori Amos and then the next she sounds more like Kate Bush, taking her songs to ethereal heights, with the odd detour into jazz and prog on the way. Like Polly Scattergood she mixes maturity with a raw, young energy and sings as if her life depended on it - or maybe more accurately as if other people's lives depended on it. Most of the time though she just sounds like Merry Ellen Kirk. Even when she's doing a blinding cover of Peter Gabriel's Lay Your Hands On Me, truly making it her own. Invisible War is instantly likable, yet it continues to grow on you due to the quality and detail in each of the songs. Have a look at the videos, listen to some songs and then put this little jar of fireflies in your basket! "Merry Ellen's CD is excellent. I like the single - Blinding Me - the best. It fits her voice and style of delivery to great effect I think". Mark Isham, Grammy, Emmy and Clio Award Winning Film Score Composer. Delivery charges for goods from the Merry Ellen Kirk shop vary depending on your location and the goods that you order. Total delivery charges will be shown on the order summary screen before you make payment.